Eamon Columba Martin was born in Derry in 1961; his parents, Catherine Crossan and the late John James Martin were both from Inishowen in Donegal and his grandparents came from Counties Donegal and Fermanagh. He has six sisters and five brothers. Eamon went to St Patrick’s Primary School and St Columb’s College, Derry where he developed a great interest in singing and later playing the trombone! He proceeded to study for the priesthood at St Patrick’s College, Maynooth during which time he took degrees in Mathematical Science and Theology. During his seminary training he was a senior cantor and leading member of the seminary choir – in his final year he was Acting Director of Sacred Music in Maynooth. His postgraduate studies were at Queen’s University Belfast, the Institute of Education in London and the University of Cambridge. After ordination on 28th June 1987, Fr Eamon was appointed to Templemore Parish in Derry City, serving as curate at St Eugene’s Cathedral. In 1990 he went to teach Mathematics and Religion at his old school, St Columb’s College. He became Head of Religious Education in 1997 and eventually President (Principal) of the College, a post he held for eight years. After leaving St Columb’s in 2008, Fr Eamon was appointed Executive Secretary of the Irish Bishops’ Conference but he returned to his native diocese as Vicar General just over two years later. Also in 2010 he was appointed Chaplain to His Holiness. Upon the retirement of Bishop Séamus Hegarty, Monsignor Eamon was elected as Diocesan Administrator of the Diocese of Derry. On 18 January 2013 it was announced that His Holiness Pope Benedict XVI had appointed Monsignor Eamon as Coadjutor Archbishop of Armagh. He was ordained Coadjutor Archbishop of Armagh on 21 April 2013 in St Patrick’s Cathedral, Armagh and on the retirement of Cardinal Seán Brady, succeeded as Archbishop of Armagh and Primate of All Ireland on 8 September 2014. To mark the occasion a Mass, to ask God’s Blessing on Archbishop Eamon and on the People of the diocese, was celebrated on 7 October 2014. 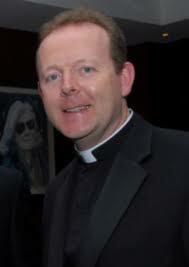 Archbishop Eamon is Chairman of the Irish Episcopal Conference. Behold the Lamb of God who takes away the sins of the world! Blessed are those called to the supper of the Lamb! The lamb standing on the altar, looking directly at us, with the background of the cross, reminds us of the Holy Sacrifice of the Mass. The sacrifice of Christ and the sacrifice of the Eucharist are one single sacrifice (CCC 1367). The standing lamb, often referred to in the Book of Revelation, is an image of hope. It represents that, by his resurrection, the innocent Christ won victory over evil and death. Witnesses to the apparition of Our Lady at Knock also described seeing a lamb, standing on the altar, in front of a cross. The blue colour of the shield and the cross fleury (with arms endings in the fleurs-de lys) are in honour of Mary, the Mother of God. 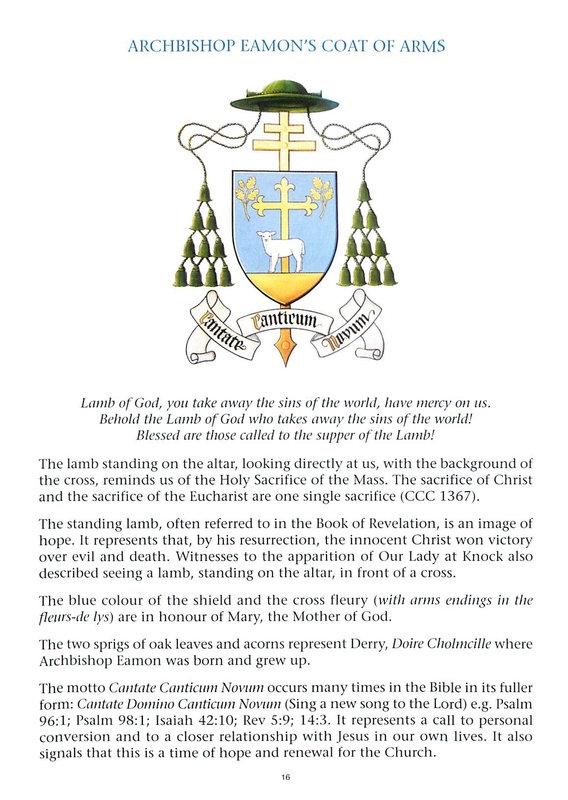 The two sprigs of oak leaves and acorns represent Derry, Doire Cholmcille where Archbishop Eamon was born and grew up. The motto Cantate Canticum Novum occurs many times in the Bible in its fuller form: Cantate Domino Canticum Novum (Sing a new song to the Lord) e.g. Psalm 96:1; Psalm 98:1; Isaiah 42:10; Rev 5:9; 14:3. It represents a call to personal conversion and to a closer relationship with Jesus in our own lives. It also signals that this is a time of hope and renewal for the Church.